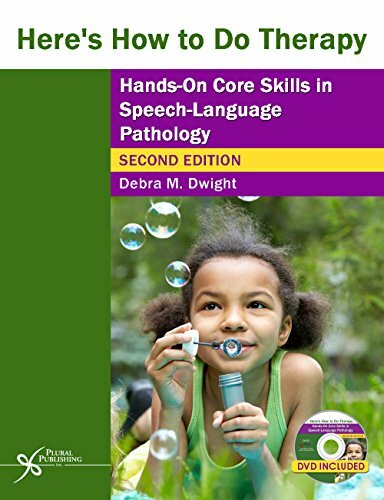 The best-selling Here s How to Do Therapy: Hands-on Core Skills in Speech-Language Pathology is back in a newly revised second edition. Unique in design and content, this text and accompanying DVD provide a logical and manageable approach to therapy and help students and practitioners enhance their clinical skills through guided practice of key concepts. Twenty-eight fundamental therapeutic skills are presented in a workshop format using organizers, definitions/demonstrations, think-out-loud questions, prompts for practice, post-organizers, and more. This second edition also includes an all new chapter that examines the concept of critical incidents in learning speech-language therapy and details 18 classroom activities for clinical supervisors and instructors. The 80-minute DVD significantly enhances the tutorial aspect of this text by presenting visual demonstrations of core therapeutic skills. One- to three-minute vignettes give students real-life examples of implementing these skills and two extended DVD sessions demonstrate the basics of language-based therapy, highlighting articulation and language intervention. Here's How to Do Therapy, Second Edition, is an ideal reference for providing effective therapy for both clinical practicum and management courses, as well as for clinicians engaged in SLP intervention. If you have any questions about this product by Plural Publishing, Inc., contact us by completing and submitting the form below. If you are looking for a specif part number, please include it with your message.